This early photograph of the Church shows the steeple, a landmark in the area but which had to be removed in 1954 because of its dangerous state and the cost of repair would have been prohibitive. The first settlement in Springwell Village dates from 1821. This consisted of a group of houses for the Sinkers of Springwell Colliery Shaft. As there was no church in the village, these people worshipped at the Mount, a church in Eighton Banks said to have been visited by John Wesley, the founder of Methodism. As Springwell grew in size, the need for a church became evident and after setting up a fund, sufficient money was raised for the project. The church was opened on 17 November 1880, issued with its Worship Certificate on 24 April 1882 and was registered for marriages in 1920 although it was necessary for a Registrar of Births, Marriages and Deaths to be on the premises during a marriage service until 1931. The Church premises ceased to be used by Usworth School Board after Springwell Council School was opened in 1905 -directly opposite the church. 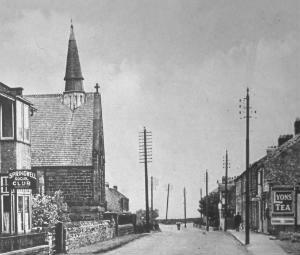 Records show that at January 1901, the Chapel was lit by oil lamps and it was decided that the Paraffin oil should be bought from the “Store”- that is, the Co-operative Society shop – now the building occupied by Finesse Upholstery and Wentworth Builders at the north entrance to the village. Electric light was installed in the Chapel in 1911 at a cost of £28.17.6d (£28.75) by direct current from Springwell Colliery. Although it has been stated that this was the first building in the village to have this form of lighting, it was in fact Springwell Council School which had had electric light installed in 1909. In 1914, breakfast and dinner was provided by the Day School Authorities in the chapel schoolroom to those children whose fathers worked at Washington Colliery which had been laid idle during World War 1. The children of parents who worked at Springwell Colliery were gradually included in the provision of these meals. During 1926, the year of the National Miners Strike, the Chapel schoolroom was used by the Education Authority to again provide breakfast and dinner to school children. It was also during this year that at the back of the Chapel, the field (part of which was originally the edge of an old quarry) was raised and levelled. The men of the church borrowed the local Scouts trek cart to carry turf from High Usworth to lay on the Chapel field. Like other villages in the area, the Chapel was very much the centre of activities other than those purely church based. Examples are Rechabites (a temperance movement to promote total abstinence from alcoholic beverages), Springwell Wesleyan Harriers and the St John Ambulance lectures in the schoolroom for the deputies of the local colliery. After High Usworth School was destroyed by fire in 1948, Durham Education Committee made use of the schoolroom until 1953. The 13th Company of the Gateshead Battalion of the Boys Brigade was formed in 1935 while the Girls Brigade Company did not commence in Springwell until 1972. The original two Brigade colours still hang in the Church although these groups ceased to meet before the new mixed age group- Y21 -Christian Youth in the 21st Century was formed in September 2001 . The Church has been added to and altered inside and out many times over the years to improve facilities, keep up the fabric of the building and to conform to Health & Safety. In 2009, a Heritage Open Day was held in the Church. Everyone was welcomed to see displays of interesting artefacts, photographs and documents relating to the history and activities of the Church as well as written explanations of items normally seen within the Church. It is hoped that another Heritage Open Day will take place in the future. Springwell Village Methodist Church has been and continues to be an important part of life to many people living in and around the Village.